As a teacher I was often annoyed when a so-called expert in the field harped on the topic of assigning “relevant” literature. Sure, it makes sense to motivate kids who are reluctant readers by offering them books about people like them, with challenges they'll recognize from their own lives. It's a great starting point. But you don't have to look like or talk like or live like the characters in a book to relate to them. We're united by a common humanity, it's good to get outside your bubble every now and then, yada yada. In my reading life, I've been able to relate to all kinds of characters, and not exclusively the bookish, wide-hipped brunette ones. So I'm a little grumpy over the fact that for whatever reason, The Turner House and I didn't click how I hoped we would. I can come up with excuses for why that might be—I don't have scads of siblings, I've never set foot in Detroit, I'm not African-American—but why should any of that matter, really? I related hard to almost every character in Celeste Ng's Everything I Never Told You (still one of my favorite reads of this year) and I've never been in an interracial marriage, tragically lost a sister, or been a man. I'm not sure where the disconnect was for me, but on paper, The Turner House has it all: family drama, personal lives in shambles, an inter-generational story arc. Francis and Viola Turner raised their thirteen children in a tiny house on Yarrow Street on the east side of Detroit. The book alternates between the present-day stories of the children, in particular the oldest (Cha-Cha) and the youngest (Lelah), and the older tale of how Francis and Viola got together and managed to stay married through some pretty significant challenges. My favorite sections, and the ones I was most invested in, were the ones about Francis and Viola. Their love story felt suspenseful to me even though I knew it was going to work out (hey, you don't end up with thirteen kids if you divorce after the first one). 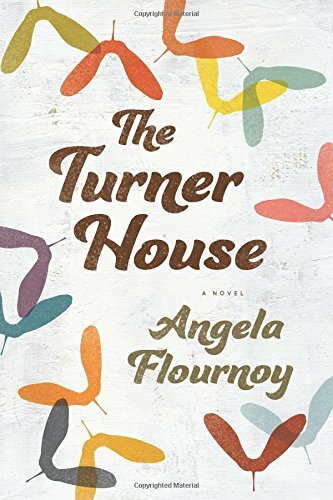 I'm always curious to see how people ended up where they are, and Flournoy does a great job demonstrating how the Turners' experiences led them to be the kind of parents they were. I was less engaged in Cha-Cha's and Lelah's stories, even though they were decidedly more modern. I typically really enjoy family dramas, so it's entirely possible my expectations for The Turner House were a bit too high. Flournoy's writing is smooth and rich, but I never warmed to the characters the way I wanted to. Still, it's a solid debut novel, and if you enjoy big, sprawling family sagas, you'll probably want to add it to your list. With regards to Houghton Mifflin Harcourt and NetGalley for the review copy. Newer:RWH Book Club: The Next Book Has Been Chosen!Older:RWH Book Club: Help Choose Our Next Book!